Everyday I’m shuffling! Well, at least you will be for the hour of The Shuffle Show. This fast paced, high energy and entertaining show will have your toe tapping and body shaking… with laughter! This dynamic duo bring their A -game in comedy, singing and dancing for a wonderfully entertaining show for the Sydney Fringe Festival. The timing of the nights performance could not have been any better with the launch of the iPhone 6 all the rage today and the show having a focus on the famous brand. 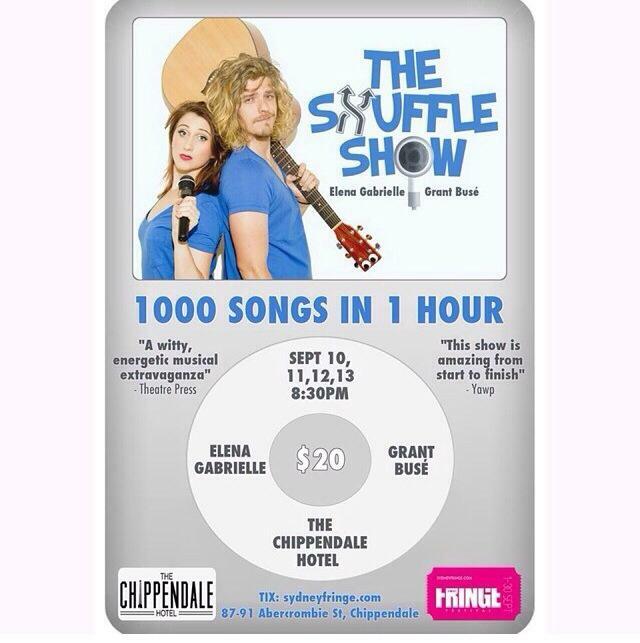 The Shuffle Show centres around the innovative Apple iPod and our geniuses Elena and Grant show us best how to maximise our music library, with hilarious results. From Britney to Crowded House, Eminem to classical opera, no song is safe from the shuffle. The two performers are incredibly gifted with beautiful voices and musical timing. As a stand alone musical performance, this show certainly appeals to the rhythm lovers. Coupled with hilarious facials, witty quips and clever jokes, this is most certainly a comedy show. Both Elena and Grant get their moments to shine alone and showcase their talents. They also get the opportunity to make the audience squirm with some interactions that are questionable and an awkwardness to make your skin crawl. All adding to the hilarity and energy of the show. This is a wonderful show that flows well and entertains throughout. The dance numbers will have you wanting to leap out of your seat and dance along to your Year 5 Disco favourites. My only complaint! I can’t get these darn catchy mashups out of my head!!! Thoroughly enjoyable evening! This is such an awesome concept and I was gutted to miss this show at the Melbourne International Comedy Festival in March of this year. Thrilled to say that “The Shuffle Show” is back and it’s coming to Sydney! I’ll be attending opening night and can’t wait to see this talented pair of performers get their shuffle on! One hour. 1000 songs. Sounds ridiculous? It is. Straight from their incredibly successful premiere season at The Melbourne International Comedy Festival musical comedians Elena Gabrielle and Grant Busé are finally heading Sydney to present an epic musical adventure inspired by your favourite and most embarrassing iTunes playlists. From The Beatles to Beyoncé, The Shuffle Show has something for everyone…except fans of One Direction…actually…okay, still no.